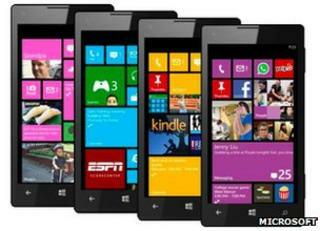 Microsoft has formally launched the Windows Phone 8 operating system in a bid to reclaim smartphone market share. It boasted that the system's internet browser, Internet Explorer 10, was the fastest on any mobile, and also suggested it offered the closest integration with video chat app Skype. Microsoft had a 3.1% share of the handset system market in the April-to-June quarter, according to IDC. The low figure has discouraged some developers from building apps for it. HTC, Nokia and Samsung have all unveiled flagship WP8 devices over recent months, but had been unable to release them while they waited for Microsoft to sign off its software. The handsets will now go on sale in Europe at the weekend and rollout worldwide during November. "It can't be underestimated how important it is to Microsoft to get a successful handheld platform," Ben Wood, director of research at CCS Insight, told the BBC. "It's the fastest growing and most prolific sector - 800 million smartphones will be sold this year, within three years that number will be up to one billion annually. Nokia has also bet the ranch on this at a time when the market is dominated by Apple and Google's systems - and Microsoft is seen as being late to the party." WP8 resembles the Windows 8 PC operating system released last week. Users navigate the interface by swiping through tiles which also display information pulled from the internet - for example weather conditions, Facebook status updates or recently received emails. While its predecessor WP7.5 was based on the firm's ageing Windows Mobile platform, WP8 shares its kernel - or software core - with its PC equivalent, which should help make it easier to port programs between the two environments. Much of the details of WP8 were announced at a previous event in June. But Microsoft had held a few features back until the San Francisco launch. The firm also showed off Kid's Corner - a function designed for parents who give their handsets to their children to play with. It allows them to restrict access to a limited number of apps without giving access to email, phone call or text message functions. Microsoft said a survey had suggested about two-thirds of smartphone-owning parents in the US had used the handsets to occupy their children while out shopping, visiting friends or some other activity. Another new feature is Rooms which allows users to create an invitation-only environment in which members share their calendars, notes, photos and other material. The firm suggested it might be used to help families, sports teams and other community groups stay "in sync". Microsoft also made much of an "always-on" Skype experience. This addresses one of the major flaws with its previous mobile system which had not allowed the video chat program to run in the background. That had meant that users of iOS and Android phones had been able to receive calls while using other apps, but WP7.5 devices had not - a notable omission bearing in mind Microsoft paid $8.5bn (£5.3bn) to buy Skype in 2011. On WP8 Skype runs in the background even if the app is closed and the phone locked. It uses a similar method introduced in the full Windows 8 system to reduce its battery use by effectively being "asleep" until an incoming notification of a call wakes up the program. Microsoft stressed the facility would also be available to other video chap apps including Tango and Qik so that its own program would not be given an unfair advantage. Despite the new features some analysts believe Microsoft could have an uphill struggle to lure customers away from Google's market-leading platform Android, and iOS which powers Apple's iPhones. Media captionThe BBC's Rory Cellan-Jones looks at what sets the Lumia 920 apart from rivals. "Windows Phone as a platform still has very low awareness among consumers, and that's the biggest challenge," Francisco Jeronimo, mobile devices research manager at the consultants IDC, told the BBC. "Apple still has a strong brand thanks to the advantage it gained by offering the best smartphone experience of its kind in 2007 with the launch of the iPhone. Android benefits from the fact it powers about 147 devices on the market in Western Europe. "There are only about 8 to 10 handsets running Windows Phone and that makes it hard for it to stand out. It won't be until we see 20 to 30 devices and people relate it to the desktop system that consumers understand there is something going on." WP8 runs software written for previous versions of the system. But Stuart Miles, founder of the gadget site Pocket-lint, said some consumers might be put off by the fact some apps - including the BBC's iPlayer - remained unavailable. "Windows Phone 8 will encourage the release of more software, and some of the apps that are already there work well - but the problem is that I've been to several launches where the developers say that a release for the system is on their roadmap but is not a priority. "So if you are a die-hard app fan you may be disappointed, but if you don't care so much about the latest third-party software then it is worth looking at." Microsoft said they have 46 of the top 50 apps on the platform so far. "That's huge progress for us," said Joe Belfiore, manager of the Windows Phone program.